Many hard-working Colorado Springs people are overwhelmed by unmanageable debts through no fault of their own. Stephen H. Swift, P.C. 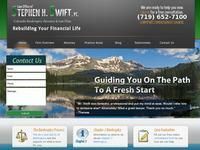 has helped thousands eliminate or reduce their debts through bankruptcy. They explain the bankruptcy laws, guiding you to better days and a more secure financial future.